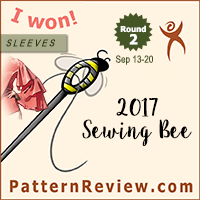 I decided on this pattern because it contained lots of sizes and was a bit shorter (less yardage) than a lot of the other patterns on the market. 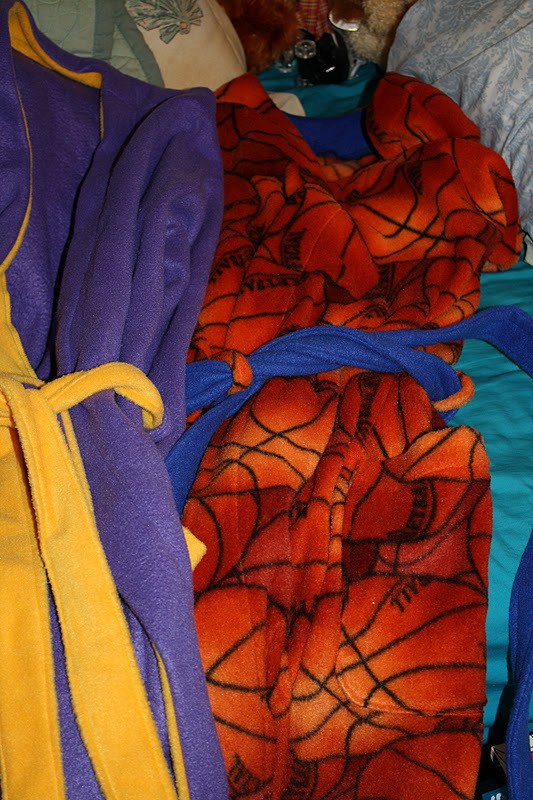 I mean, I couldn’t be having it mistaken for a Snuggie now could I? 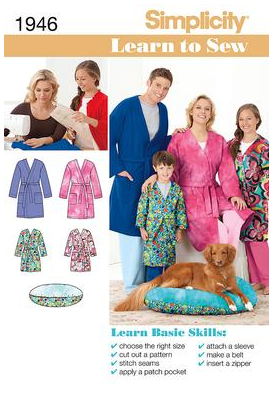 Pattern Description: Bathrobe with tie belt and patch pockets in adult and child sizes. Also included is a pattern for a dog pillow. Pattern Sizing: Child/Adult: XS-L/XS-XL. I appreciated that all of the sizes come in one envelope so I could make versions for different people but only buy one pattern. Were the instructions easy to follow? Yes, almost too easy! Since this is a “Learn to Sew” pattern, Simplicity walks you through all of the steps, including basic discussion of fabrics, how to measure, and how to read and understand pattern markings. The diagrams seemed a bit larger and more detailed than usual as well. The instructions were so detailed it was actually almost annoying. When they have to include instructions on how to put on the finished bathrobe (I quote: “On OUTSIDE, slip belt through belt loops. 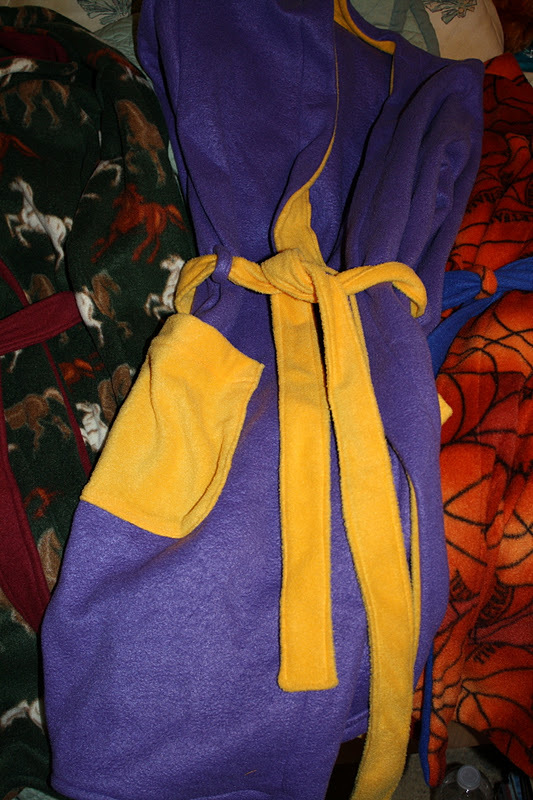 When wearing robe, wrap one side over the other, tie belt in knot to hold in place.”), I think they have taken the Learn to Sew aspect a bit too far. The instructions were also sort of annoyingly cheerful, including bold statements of encouragement after finishing major steps. It felt very much like the self-satisfied sighing doors from Douglas Adam’s Hitchhiker’s Guide to the Galaxy. I think I have grown accustomed to Burda – if I don’t spend an hour puzzling out at least one of the steps then where is the challenge? All kidding aside, the instructions are very easy to follow and would be perfect for a first-time project. What did you particularly like or dislike about the pattern? Likes: Very easy to put together. 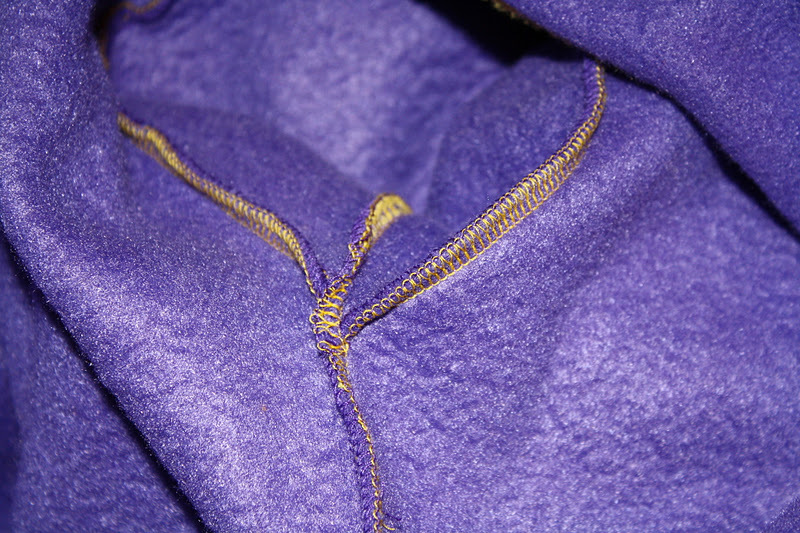 I sewed all the major seams on my (new) serger, and it was so very fast. 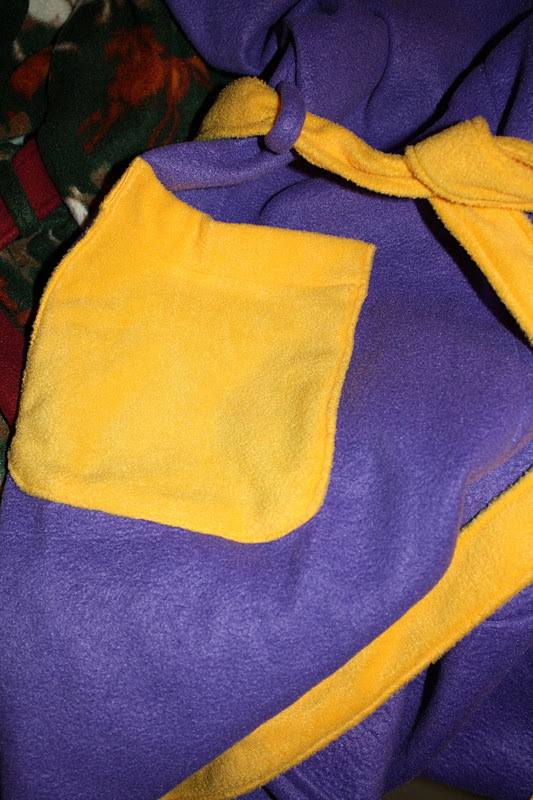 The side seams are sewn after attaching the sleeves, so they do not have to be set in, which makes it very easy to sew together. 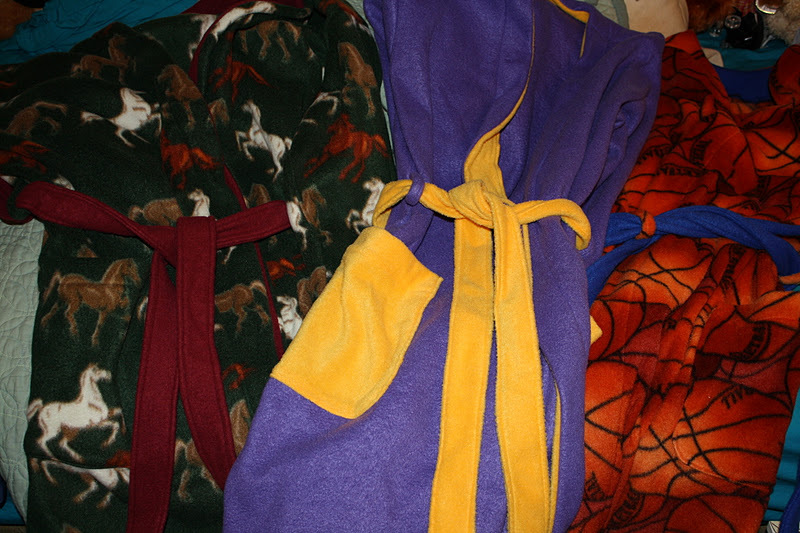 I love that all of the sizes are in one envelope, and I like the robe style with the pockets. Dislikes: The sizing isn’t my favorite. I think there is too much ease on the top and not enough ease on the bottom. I would possibly recommend going down a size on the top and up a size on the bottom depending on where your measurements fall. And, as I mentioned above, the instructions are annoyingly cheerful, but I mostly ignored them after my first run-through with the pattern. 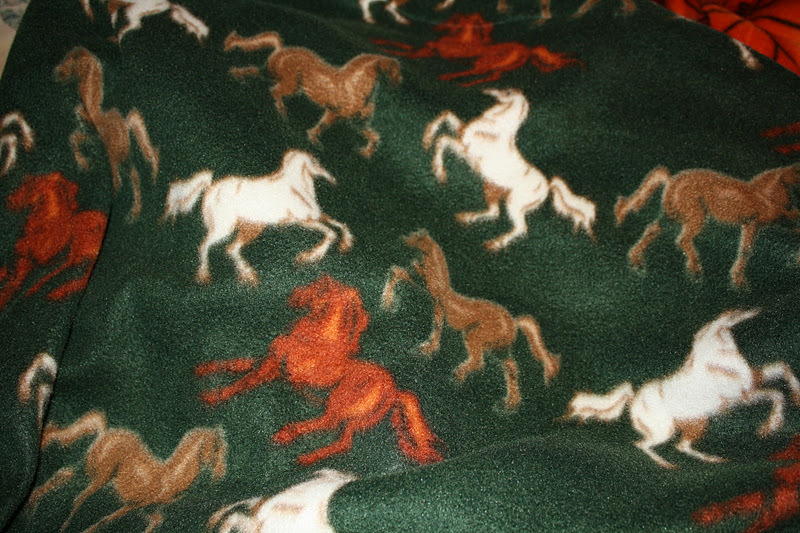 Fabric used: Polyester fleece (prints, anti-pill, blizzard) from Joann’s and Hancock. 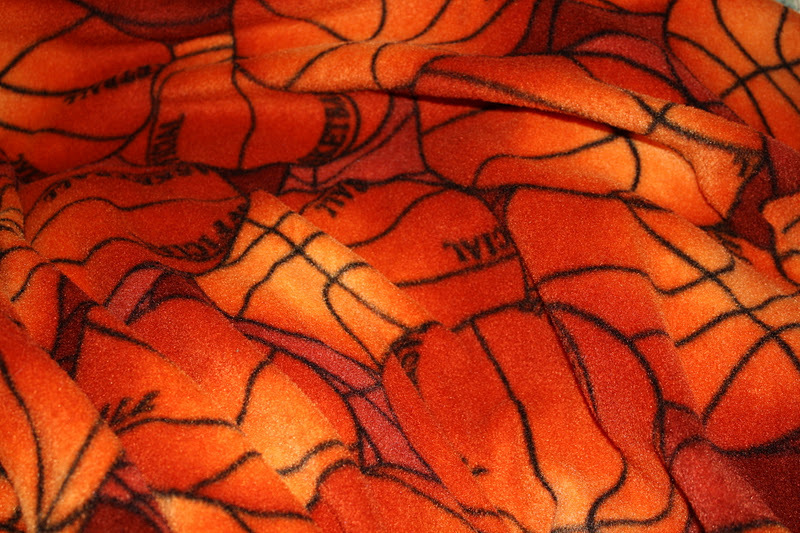 Very easy to sew, easy to use with the serger, easy to wash, easy to find. I now have a lot of leftovers and I am trying to decide what to do with it all. I have already made a few scarves, but still have far too many leftovers. Pattern alterations or design changes you made: I left out the interfacing. I know, I know, bad seamstress! 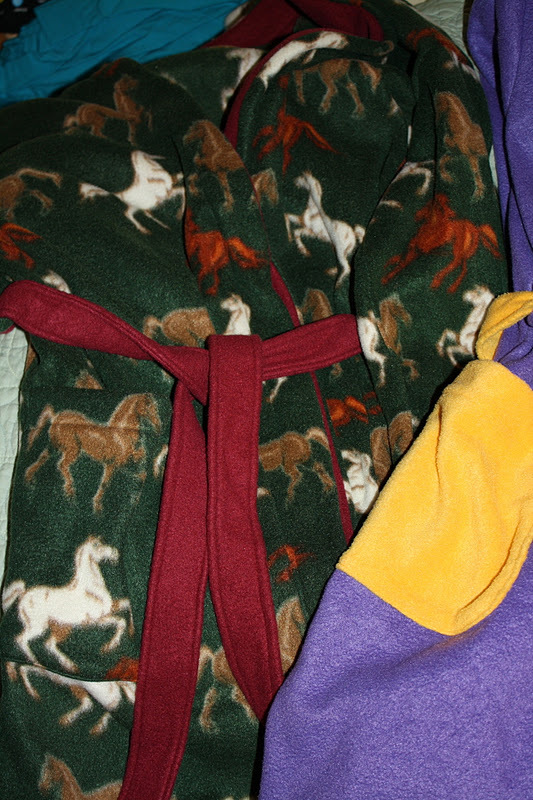 But really, they are just bathrobes! I didn’t see the need for additional support and I wanted the neckline to be soft and not too stiff anyway. Time will tell if this was a bad decision. Would you sew it again? Would you recommend it to others? I already made it 3 times, so I am not exactly eager to make another one, but, if I find myself in need of a bathrobe I probably would use this pattern. Especially since I would know what sizing to use for myself (XS top/L bottom for me, though I would measure at a size S/M). 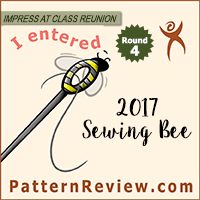 I would recommend it though – it is very fast to sew up and very easy as well. Conclusion: Great beginner pattern, nice fast results. I am happy I chose it because I was able to make lots of gifts in a reasonable amount of time.